If you are one of those readers who doesn’t read prologues, better think again. 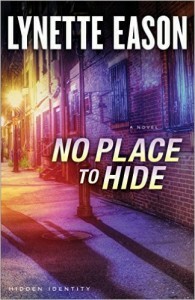 No place to Hide explodes into action with the very first sentence of the prologue and never stops. Heroine Jackie Sellers spots her childhood boyfriend, Ian Lockwood, on national television. He is wanted in connection with a terrorist plot. She cannot believe the Ian she knew so well would have betrayed his country, and sets out to help him clear his name. The problem is, he is wanted by the FBI as well as those whom he claims have framed him. By getting involved with Ian, Jackie is now also on the wanted list by both groups. The suspense in this book never ends. As they arrive in a safe place to hide, within a matter of minutes the viewpoint switches to the FBI team or one of the many bad guys, and you know they’re in trouble. Sure enough, within the next few pages, they’re on the run again. I only realized this book was one of a series after I’d finished reading it, so readers who haven’t read the others in the series need not hesitate to read this. It is a totally stand-alone novel, although I definitely plan to look for the first two in the series. The Christian standpoint is there throughout, although it is not pushed, and I would not hesitate to recommend this book to all those who enjoy a good clean suspense novel with a romance element. Thank you to Revell and Netgalley who provided me with a copy of this book for an honest review, and thank you Lynette Eason for some nail-biting moments!